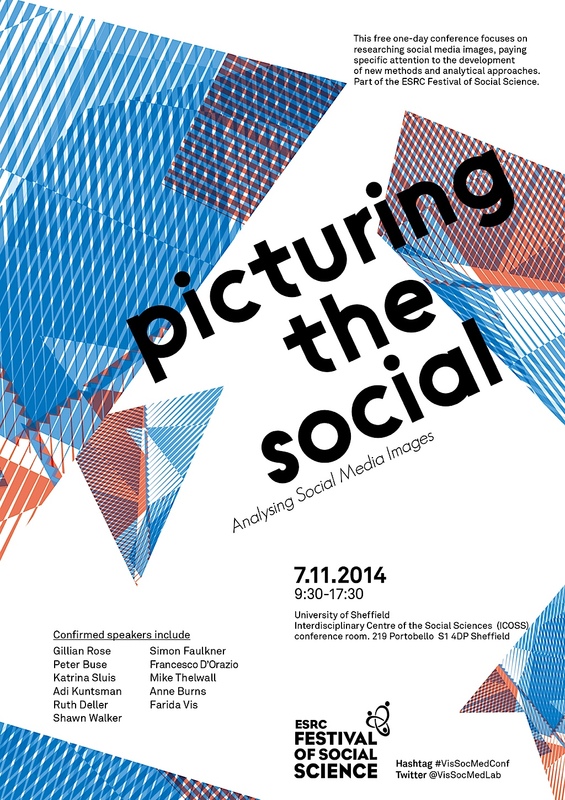 Picturing the Social: Transforming our Understanding of Images in Social Media and Big Data research is an 18-month research project that started in September 2014 and is based at the University of Sheffield in the United Kingdom. It is funded through an ESRC’s Transformative Research grant and is focused on transforming the social science research landscape by carving out a more central place for image research within the emerging fields of social media and Big Data research. The project aims to better understand the huge volumes of images that are now routinely shared on social media and what this means for society. How can these new forms of social expression be understood through studying their technical infrastructures? How can a bottom-up understanding of social media users inform how these structures are experienced? How can we devise comprehensive methodological and theoretical strategies for the capture and interpretation of social media image data at different scales? How can the study of images become a central focus within social media and Big Data research and have an impact on key stakeholders and end-users? The project will conduct a survey of social media users, focus groups, and a series of in-depth interviews with different user groups (artists and cultural producers, industry researchers and academics). Picturing the Social will also be developed through a series of smaller projects, led by individual members of the lab. These projects are: a 12-month digital ethnography, Imaging Sheffield (led by Anne Burns), The Death of Thatcher on Social Media (led by Simon Faulkner), Unremarkable Images (led by Olga Goriunova), Algorithmic Visibility (led by Farida Vis) and A Visual Atlas of Happiness (led by Francesco D’Orazio). Finally, the project will also develop a free research tool (led by Mike Thelwall and Francesco D’Orazio). The project held an inaugural conference in November 2014, part of the ESRC Festival of Social Science. See our events pages for full details. In order to work more closely with a range of different stakeholders and to outlive this initial funding, the project also launched The Visual Social Media Lab.